One Chicago ad agency—Lord & Thomas—overshadowed all the rest, achieving greater national influence and notoriety than any other agency in the United States. Albert Lasker started at Lord & Thomas as a floor sweeper. In 1904, became general manager at a salary of $52,000 per year, and within a decade owned the agency. Preaching that advertising was “salesmanship in print,” he clarified client account/creative partnerships, held firmly to the 15% commission, financed some campaigns for clients, scorned research and trained many future agency leaders. Lasker drove L&T to No. 1 rank, left in 1921 to serve in Washington, returned to a faltering agency in 1923, ruthlessly revived it, built Kimberly-Clark Corp.’s Kotex and Kleenex businesses and created Lucky Strike cigarette ads aimed at women. In 1942, he sold his L&T holdings so that the shop could reopen — in January 1943 — carrying the name of the key executives in the agency’s New York, Chicago and Los Angeles offices — Foote, Cone & Belding. He traveled the city in a yellow chauffeur-driven Rolls Royce and maintained a suburban estate with a staff of 50. Lasker hired the best copywriters in the business and taught them that advertising was “salesmanship in print”—probably the best-known definition of the advertising business in twentieth-century America. The most legendary American advertising copywriter was Lord & Thomas’s Claude C. Hopkins. 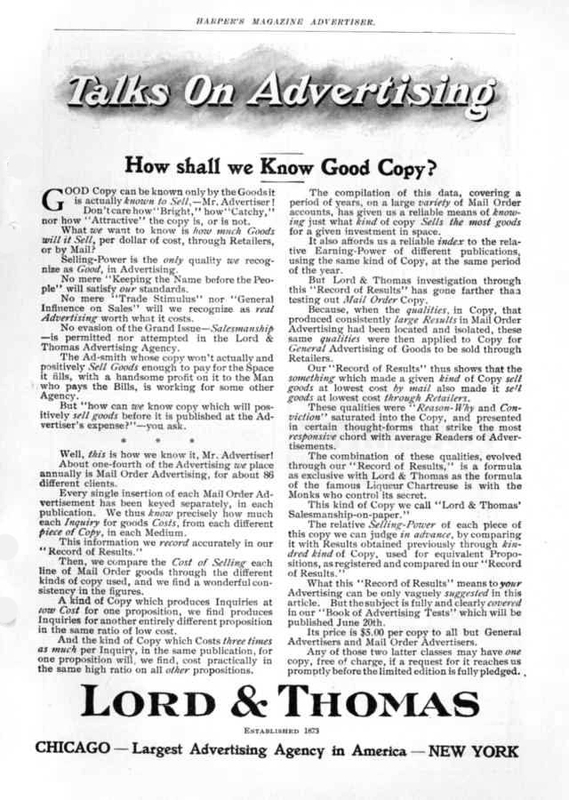 In his popular autobiography, My Life in Advertising (1927), Hopkins captured the populist style of Chicago advertising as literature for the common people. Hopkins is probably the father of consumer advertising for branded goods. He dubbed Schlitz the “beer that made Milwaukee famous,” created unparalleled brand equity for Palmolive soap and Pepsodent toothpaste, wrote the “shot from guns” slogan for Quaker Oats, and invented free product sampling through print coupons. Hopkins penned the most influential book ever written about advertising—Scientific Advertising (1923). s one of the greatest copywriters in the history of advertising, Claude C. Hopkins made a lasting impact on the way advertising is created. At the same time he brought great success to his clients and earned himself an unparalleled salary of $185,000 a year, in 1907! 1899 (left) and 1909 (right) featuring one of the first uses of coupons. He wrote one advertisement for Van Camp Evaporated Milk that caused more than 1.46 million coupons to be redeemed. By learning the science of brewing beer, Hopkins was able to create a campaign that lifted Schlitz Beer from fifth place to a tie with Budweiser for first. Lord & Thomas and Lasker blazed an impressive track record. They were responsible for branding the California orange crop and creating Sunkist, a more marketable product since oranges now had a name that could be promoted. The agency also promoted the invention of the juice machine and subsequent popularization of orange juice as a daily morning beverage. It also worked similar magic with raisins (Sun-Maid) and took Lucky Strike, an obscure cigarette brand, and made it a top seller. An early proponent of radio advertising, the company sponsored the infamously hilarious minstrel comedy, “Amos ‘n’ Andy,” and later picked a relatively obscure wisecracking comedian to star in a show sponsored by Pepsodent, a toothpaste client. Thus was Bob Hope’s career launched. Lord & Thomas also broke ground by first advertising a product whose purpose was deemed unmentionable — Kotex sanitary napkins. As a window to an earlier era, and a source of insights into the commercial and cultural origins of the advertising industry (and one of its guiding lights), this portrait of Lasker is a worthy contribution. Lasker sold Lord & Thomas in 1942 to three employees (Messrs. Foote, Cone & Belding). Fairfax Cone led the new company into an unparalleled era of creative broadcast advertising. The agency built some of the most successful broadcast advertising brands of all time, including the “Hallmark Hall of Fame,” Clairol’s “Does she or doesn’t she?” and Dial soap’s “Aren’t you glad you use Dial?” Cone’s client-sponsored broadcast programs helped make superstars out of such performers as Frank Sinatra and Bob Hope. 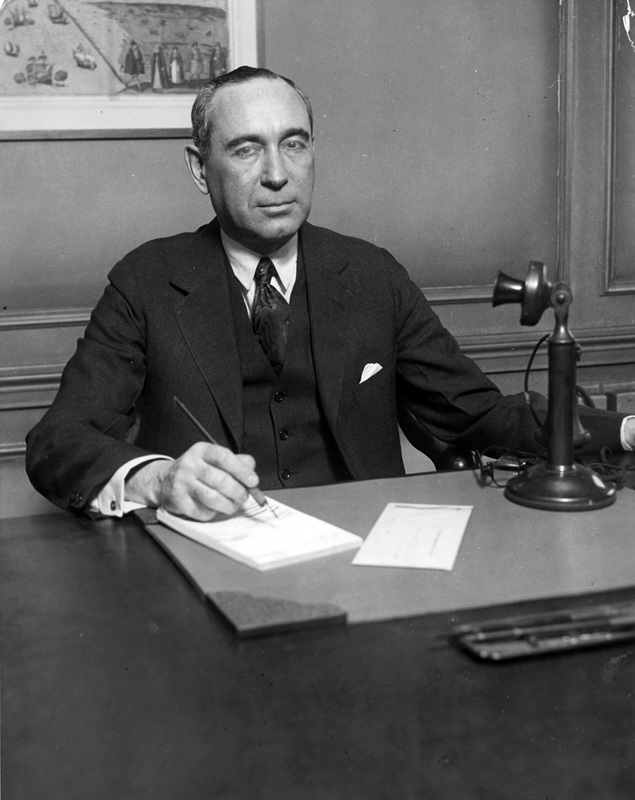 Cone also led the Chicago advertising industry into public philanthropy, supporting the University of Chicago, opera, and many other endeavors. Lord & Thomas now claims the distinction of being: the largest general advertising agency in the United States. No American Advertising Agency has ever made a statement showing as much business as they show. They claim leadership not only in the gross amount of advertising cleared through their organization, but also in the number of individual accounts on their books. These numbered 685 in February. It is said that no other agency has ever shown more than 200. While ours Is the largest aerency In the country, we do not seek to handle large accounts to the exclusion of small ones. In fact, we would hesitate to confine ope rations to a half-dozen very large accounts. We seek particularly accounts ranging from $1,000 to $000 a year, and to scatter a number of, them over a wide range of commodities. rhaps, than any other agency. ava built up hundreds of small accounts. the largest, advertisers individual attention. Our growth depends on it. mail order lines, a total of S4.O0O.UOU.OO. Order, farm, religious and. trade journal. tising when goods are sold through retailers. nates the element of chance. prominent ones that are weak.
} makes them highly profitable. I reputation, old and great in circulation. ‘ and with smaller circulation. was tried in both with the same result. development of our smallest, and vice versa. , the character of a circulation may change. – profitable mediums for several seasons. He drops out some summer. not pay. for some reason. }\ the lust thing he blames. he is willing to distrust the paper. r from a dozen advertisers on that paper. So the paper comes under suspicion. dailies in the Southern city. smaller paper woke us up. were using the smaller paper, too. They were alive to conditions. So* we put our general advertisers into it. paper while this investigation was going on. 1 ? for his money. most effective kinds of copy. A page In Munsey ‘s coats S500. What goes into the space— that makes the . a year— or fewer, probably, than with any >. cessful copy Is not broad. the Record of Results department. ing to copy and publications. Probably the pulling power of copy and . at least this side of Judgment Day. it the record of returns for the last week on ? is no way of getting behind the returns. 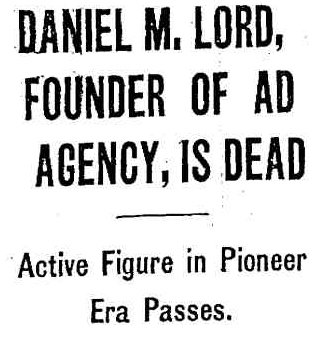 Daniel M. Lord, founder of the ad- vertising firm of Lord & Thomas & Logan 5nd a pioneer Chicagoan of the era of M[ Field and Potter Pal- mer, died yesterday in Ncew York City at the age of SG. The body be brought here for burial at Oakwoods –fnet-rv. tomorrow morning on the Twentieth Century. Services will be In the cemetery at noon. – Mr. Lord had lived in New York City 196. lie retired from the firm in I904 , of nis Interests to C: R. Irvin, D. L. Taylor, and Albert 1j. Liiskcr, now chairman of the board and president. Surviving him are two sons, Arthur D, Lord a New York broker; Danlel 31. Log.Jr., with Halsey Stuart & Cc.. too daughters, Mrs. Alice Lord ‘ and Mrs. Florence Lord lough. Mr. Lord, who came to Chicago as a boy from Long Island, N. Y., In 1h7,6. to see the business he on “faith and a shoe- string” become an international agen- cy placing a volume of advertising In excess of $20,000,000 annually. In his early days as president of Lord & Thomas lie placed much of the advertising for Palmer, Field & Leiter and as illustrative of the conservatism then, lie would cite the fact that the largest ads were not more than six or seven inches deep. Ills memories of early Chicago were rich in personal lore. After the fire he had offices in the Linns block at the east end of the 1Randolph street bridge. Carter Harrison, the older, had desk room with him. Mr. lord never forgot Air. Harrison’s method of enjoying a short rest at luncheon time. fie would take a billiard ball out of a drawer, place It in the palm of his hand and lie down on a lounge. As soon as he had completely relaxed the ball would fall to the floor. That would be the signal his rest was over. For thirty years, until Mrs. Lord died, Mr. Lord lived at 5450 Cornell avenue. IHe then moved to the Chi- c.igo Athletic association, In which he was an active leader arid once served atd president. He was also a member of the Union League club. lie was deeply in phil- work, and contributed to the United Charities. In announcing his retirement from Lord & Thomas on his 60th birthday, Mir. Lord revealed lie had made up his wind to do that 25 years before. Mr. Lord was born in Newton Cor- n( rs, just outside Boston. He ob. tained his original capital In the ship- ring business during the civil war. FORTUNE — In an excerpt from “The Man Who Sold America” authors Jeffrey L. Cruikshank and Arthur W. Schultz explain how Albert Lasker, an enigmatic ad man, invented many of the tactics still used in advertising today. Here, in what served as inspiration for Don Draper’s character in the AMC series “Mad Men,” Lasker convinces his client American Tobacco to focus their ad budget on one brand — Lucky Strike — and to play up the benefits of the industry-wide practice of “toasting” tobacco. Lord & Thomas’s first piece of advice to American Tobacco must have come as a surprise: Stop advertising most of your brands. 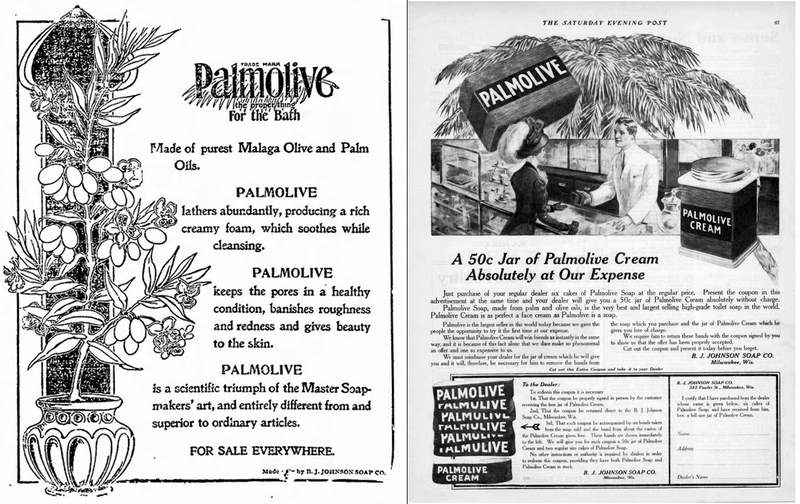 Lasker argued that rather than maintaining many modestly successful small brands, the company needed to create one overwhelmingly powerful product that could compete with Camels and Chesterfields. “You can’t live unless you have this one brand,” Lasker recalled saying, “because 80 or 90 percent of the cigarette business in this country today is on this one type of cigarette. [George Washington Hill, son of Ameritcan Tobacco CEO Percival Hill, and entrusted with managing the Lucky Strike brand] agreed. As a result, the money formerly spent advertising Blue Boar — the original Lord & Thomas account — and most of the other minor American Tobacco products was diverted to support Lucky Strike. 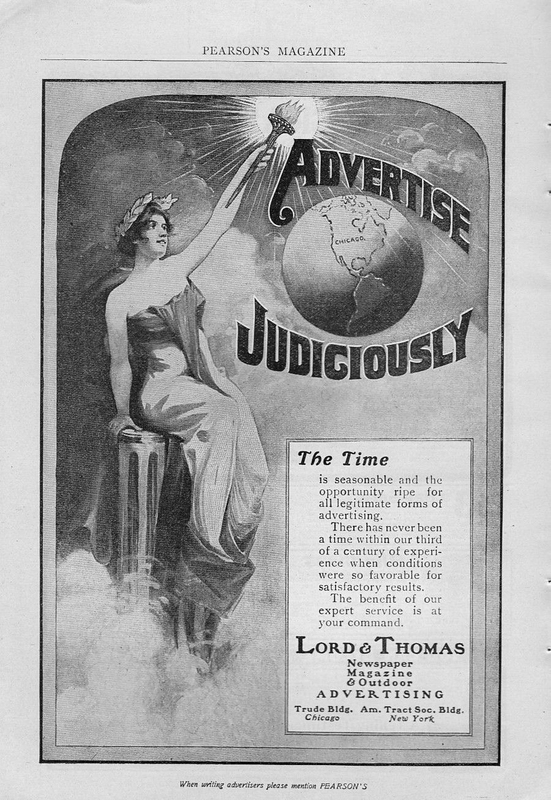 The first Lord & Thomas campaign on behalf of the now-favored brand built upon the earlier concept of “toasting,” which attempted to differentiate Luckies based on the preparation of the tobacco. The copy stressed the unique benefits of toasting, including improved flavor and reduced acidity, supposedly making it easier on the throat. It was classic Claude Hopkins [a Lasker protegé who later became chairman of Lord & Thomas]: true, the tobacco used in Lucky Strikes was heated to somewhere between 260 and 300 degrees during the manufacturing process — but this was common practice in cigarette manufacturing. The brand still wasn’t doing well enough to satisfy the hugely ambitious Hill, so in 1927, Lord & Thomas began complementing the “toasted” theme with a series of advertisements that became known as the “Precious Voice” campaign. This new campaign argued that, in addition to making cigarettes easier on the throat, the vaunted toasting process actually helped protect the throat and voice. One thing that distinguished “Precious Voice” was its target audience. At that time, the social stigma against women smoking was still powerful. Although Philip Morris had introduced the first women’s cigarette in 1924 (claiming that it was “mild as May”), few women smoked openly, and most restaurants and other public places prohibited smoking by women. But women were beginning to smoke in the home, and Lasker realized that a vast new market was ready to open up. This was brought home to him one afternoon at the Tip Top Inn, a restaurant near his Chicago home, where he was lunching with his wife. Flora tended toward obesity, and her doctor had suggested that she take up smoking to curb her appetite. But on this particular day, when she attempted to light up after lunch, the restaurant’s proprietor rushed over and said that he could not permit a woman to smoke in the main dining room. If Flora wished to smoke, he continued, the Laskers would have to retire to a private room. No doubt the prospect of doubling the potential market for Luckies also influenced his thinking. Lasker took his idea to George Washington Hill, and told him that if American Tobacco acted decisively, the women’s market might be theirs for the asking. The subtext, of course, was that women — sophisticated, worldly, even exotic women — who earned their livelihood by singing were willing to trust their precious voices to Luckies. Precious Voice was one of the first Lord & Thomas advertising campaigns to rely heavily on testimonials, and very quickly, the campaign expanded to include almost all the stars of New York’s Metropolitan Opera. Just as Lasker had anticipated, stage and screen stars (both women and men) also rushed to join the chorus of artists praising Luckies. Incredibly, none of the individuals testifying for Luckies were paid for their contributions; they considered the free publicity compensation enough. Though New York is the epicenter of American media, Chicago cemented a leading role in advertising more than a century ago, thanks to the success of hometown catalog companies Sears Roebuck & Co. and Montgomery Ward & Co. As industries from canned food to clothing began creating mass-produced goods, manufacturers, catalogers and retailers such as Marshall Field’s scrambled to lure buyers with snappy text and appealing drawings. The city’s agency roots date to 1881, when Daniel Lord and Ambrose Thomas formed Lord & Thomas in the Loop. 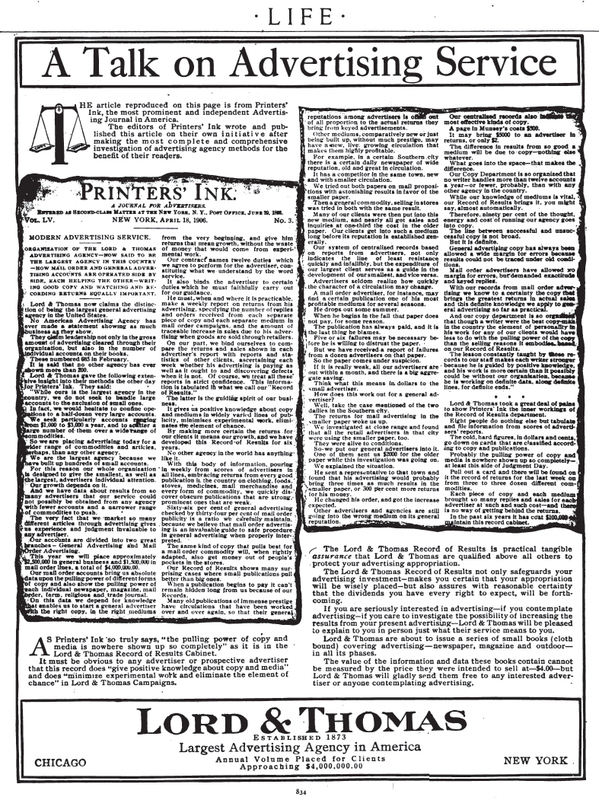 The firm eventually became Foote Cone & Belding, a predecessor of today’s DraftFCB. Crain’s sister publication Advertising Age was founded here in 1930. Even though it lacked the glamour of Madison Avenue, Chicago’s ad world factored significantly in the industry’s creative revolution of the 1950s and ’60s. A middle-aged, bespectacled Michigan native in perpetually wrinkled suits, Leo Burnett didn’t look like the hip art directors and copywriters flooding New York, but he churned out icons including the Jolly Green Giant, Tony the Tiger, the Pillsbury Doughboy and, most famously, the Marlboro Man. This was advertising’s golden age. Television was coming into its own, and consumers were cheerfully opening their wallets. Advertising dramatically influenced consumption habits: Philip Morris & Co. sales skyrocketed from $282.8 million in 1954, before Mr. Burnett’s ads went national, to $386.2 million. Duffers and history buffs alike will get to follow in the footsteps of Bobby Jones and Bob Hope this weekend as they retrace a vanished golf course considered one of the best in the country in its day. The beautifully manicured fairways of Mill Road Farm, built in the 1920s, were replaced by subdivisions after World War II. Last winter 30 Lake Forest College students used original plats and satellite images to flag about 10 holes. The course was the brainchild of Albert Lasker, head of Lord & Thomas, a now-defunct Chicago ad agency that was among the largest in the U.S. Lasker rubbed elbows with celebrities, helped launch commercial radio and bought a stake in the Chicago Cubs, according to the Lake Forest-Lake Bluff Historical Society, which is hosting the tour Saturday as part of an exhibit on local golf history. Despite his success, Lasker, who was Jewish, couldn’t wrangle an invitation to the exclusive Lake Forest golf clubs where he longed to play. In 1921 he bought 480 acres of farmland north of Half Day Road on the western fringes of the town and set up an even more exclusive club — in his own backyard. “He wasn’t invited to play at some of the other courses, so he built his own,” said Laurie Stein, curator of the historical society. From 1927 to 1942, the 7,000-yard Mill Road Farm golf club stymied even legendary pros. With its own clubhouse, caddy shack, resident pro and groundskeepers, it also may have been the best-kept secret in golf with only a handful in Lasker’s inner circle ever getting to play there. The estate was designed by renowned architect David Adler and built between 1925 and 1928 for about $3.5 million. It featured a 50-room, 25,000-square foot French provincial mansion and 26 outbuildings. Those included a horse barn, cocktail house and an air-conditioned theater. Lasker’s favorite amenity may have been a converted farmhouse that served as woodsy clubhouse and caddy shack overlooking the first tee. The William Flynn-designed course was built at a cost of about $1 million and was immaculately maintained. A who’s who of golf made the rounds with Lasker, including Gene Sarazen, Johnny Farrell and Bobby Jones, who reportedly called the course one of the three best in the country. So challenging was the course that Lasker offered $500 to any pro who could break par, a feat not accomplished until 1934, when Tommy Armour collected the prize after shooting a 69. The course’s run ended just a few years later. Lasker’s wife of 33 years, Flora, died in 1936, and Lasker retired from the advertising business, devoting himself to public affairs and philanthropy. In 1940, he donated the estate to the University of Chicago. In June 1940 his course hosted its only tournament, the Western Junior Championship. Two years later, it closed to make way for development. Lasker remarried in New York. In 1942 he and his wife established the Albert and Mary Lasker Foundation to support medical research. Lasker died of colon cancer in 1952 at age 73. Key findings by the Lake Forest students include the second green in the 1800 block of Farm Road, where the hole has long served to hold a backyard tetherball pole. The 16th fairway is in the 1100 block of Oak Knoll Drive. The two-hour tour Saturday costs $70 and starts at 10 a.m. from the Lake Forest Telegraph Road train station. It includes visits to the restored clubhouse and Lasker’s mansion, at 1352 Estate Lane, which survived a brush with demolition in the early 1990s. Dr. James Milgram, 70, an orthopedic surgeon, bought the property for just over $1 million at a 1992 auction. “We live like millionaires without being millionaires,” he said. Albert Davis Lasker, a former Chicagoan, one of the nation’s outstanding advertising executives, a philanthropist, and former chairman of the United States shipping board, died yesterday in New York City. He was 72. Mr. Lasker died of cancer in Harkness pavilion at Columbia-Presbyterian medical center. He had contributed thousands of dollars to cancer research and thru liberal donations to the Lasker Foundation at the University of Chicago, financed study and research in the field of degenerative diseases and birth control. Mr. Lasker, who pioneered modern advertising methods, was born in Freiberg, Germany, in 1880 of American parents traveling in Europe. He was reared in Galveston, Tex., and began his working career at 15, later becoming a reporter on the Galveston News and the Dallas News. In 1898 he came to Chicago to work at $10 a week with the advertising firm of Lord and Thomas. Twelve years later he owned the business. One of his outstanding advertising feats was to sell the public on canned condensed milk. It was Mr. Lasker who showed industry how to enjoy tremendous sales increases by trebling their advertising budgets. In his career with Lord and Thomas, the firm placed more than 750 million dollars worth of advertising and became one of the largest and wealthiest agencies. He liquidated the company upon his retirement from active business in December, 1942. Once Part Owner of Cubs. Mr. Lasker once was part owner of the Chicago Cubs baseball team and took an active part in the reorganization of baseball following the Black Sox scandal of 1919. This was completed with the appointment of Judge Kenesaw Landis as baseball commissioner. Mr. Lasker later sold his holdings in the Cubs to William Wrigley. Mr. Lasker, an early golf enthusiast, helped establish public courses with “grass greens” to promote scientific putting. These were in Pasadena, Cal. Similar greens later were installed thruout the country. He built an 18 hole course on his Mill road estate in Lake Forest, a fabulous #3,500,000 farm which he donated to the University of Chicago for recreational purposes as well as research. The estate is noted for its beautiful gardens, pools, hiking trails, and wooded areas. In its center is a 50 room French manor house. A. D. Lasker, former chairman of the United States shipping board, has sold his large holdings in the Cubs, Chicago’s National league ball team, to William Wrigley Jr., the other majority stockholder, It was learned yesterday. The transaction took place some time ago, but there was no announcement at the time. Mr. Lasker made it clear that there had been no misunderstanding between himself and Mr. Wrigley in any degree. In connection with the sale it wan reported that a perfectly friendly difference of opinion existed between Mr. Wrigley and Mr. Laskcr concerning the methods of training the Cuba. Mr. Wrigley, it was said, was for the less formal ways of whipping the players into shape annually, although ho demanded when they got on the field that they must exhibit championship baseball. This, it was reported, was not Mr. Lasker’s method. The former chairman of the shipping board, believed In the more Spartan training, the rigorous, denying, self-sacrificing grind was what he thought built up the fiber and sinews of the playero until they were invincible on the field. This reported difference of opinion was denied, however. “Please make it plain that that is not so,” said Mr. Lasker. Mr. Laskcr then said he made Mr. Wrlgley a proposition. He offered to buy all Mr. Wrigley’s stock in the Cubs for $200 a share or to sell all his holdings to the latter for $150 a share. He said he knew that Mr. Wrigley was highly interested in baseball and that he would rather buy Mr. Lasker out at $150 a share than to sell to him at $200 a share, and that was why he made Just such a proposition to his friend, Wrigley. Mr. Wrlgley could not be interviewed on the matter; he is on the high seas on his way home from Europe on tho Leviathan. He is said now to hold about 75 per cent of the stock In the Cubs, and although the team has not been a pennant winner in recent years, it la said to be one of the most popular In the league, a drawing card always, and a money maker. William’ L. Veeck, president of tho Cubs, and Adolph Splelmann and W. M. Walker, merchant and commission men. are the minority stockholders. –He hired William L. Veeck, a sportswriter, to be president of the club. Among other things, it was Veeck who was credited with planting ivy on the outfield walls at Wrigley. Influenced by his father, his son, Bill, became one of the most colorful owners in baseball history. –Lasker bought future Hall of Fame pitcher Grover Cleveland Alexander and catcher William Killifer from the Phillies in 1918 for the unheard of sum of $50,000. It signaled the Cubs would be willing to spend money to field a winning team. –Outraged by the Black Sox throwing the 1919 World Series and other reports of gambling infiltrating the game, Lasker pushed for outside people to govern baseball. First, he thought of a three-person commission; a leader for the American League, National League and the minor leagues. Eventually, Lasker felt one person should serve as baseball’s commissioner. Through an associate, they approached Kenesaw Mountain Landis about taking the job. –Ever the advertising man, it was Lasker who changed the name of Cubs Park to Wrigley Field. “This will do your chewing gum business a lot of good,” he said to Wrigley. Lasker reportedly got tired of baseball. In 1925, he sold his controlling interest in the Cubs to Wrigley.